If you are wondering what you need in order to safely and securely tether an RV to the vehicle that you are driving, you’ll be glad you’ve come across this page. You’ll need what is called a weight distribution hitch, which can prevent one of thousands of things that could possibly go wrong as you are towing your trailer or RV. It is not enough to just have a strong connection from your vehicle to your trailer; without a weight distribution hitch, weight will be shifted unevenly to many areas of your trailer, causing it to skid in an adjacent lane as you make a turn. This is very dangerous and hazardous, so be sure to get a weight distribution hitch to keep the trailer straight and inside your lane at all times. It also helps to slow the RV down when your vehicle does so that the momentum of the RV doesn’t continue onwards and ram the back of your vehicle. In this review, we will be analyzing five great weight distribution hitches for RVs from brands such as Equal-i-zer, Husky and Anderson. We will point our all their great features as well as their important flaws. We will then tell you which is the hitch that we would most likely buy. Can fit on most vehicles. Can haul more than just RVs. Comes with multiple frame brackets. Is built to last a long time. First is Equal-i-zer’s weight distribution hitch. It is a 4-point sway control hitch that comes in painted black color. This weight distribution hitch is said to work with not only RVs, but horse trailers, boats, utility trailers and mobile homes. Essentially, if your vehicle has a bumper, it can be towed. The hitch’s body is made entirely of steel that cannot be pulled apart. This is a tough and rugged weight distribution hitch overall. There are many different versions of this weight distribution hitch. Each version has a different weight limit. There are some versions that offers a lower maximum weight and some with a higher max weight. There is even a version that does come with its own hitch ball. The shank included with this hitch has a seven-inch rise and a three-inch drop. It also fits two-inch trailer or RV receivers and is one foot in length. This weight distribution hitch helps to make towing your RV much less stressful. It helps the RV turn, stop and shift momentum where it needs to go at all times. All wheels stay on the ground at all times, and the RVs is kept from swinging around you at each turn. No other accessories or add-ons are necessary in order for this hitch to work. Everything you need is already in the box, so all you have to do is install the hitch and hook it up to your RV. This is a reliable weight distribution hitch with the potential to regulate a very heavy trailer. 10,000 pounds equates to five tons, which is commonly reserved for king sized RVs. This weight distribution hitch comes with a lifetime warranty. No matter if you own the hitch for one year or ten, the company will honor it so long as they are in business. Lifetime warranties make companies feel confident, making consumers think that they will very rarely ever be necessary. Replacement parts are also available if need be. This hitch, however, does not seem to be compatible with all trailer frames. This often has to do with the shape of the vehicle’s bumper. If this weight distribution hitch does not fit on your frame, modifications will have to be made, or you will need to buy and replace the frame of your RV, which is likely something you do not want to end up doing. Is not compatible with all RVs. Camco is a company that creates many different products for RVs, such as toilets and macerators. They have their own line of weight distribution hitches, called EAZ Lift. This hitch is available in four sizes, and this size is the second largest. The tongue weight capacity of this hitch is 1000 pounds, meaning that this hitch can haul 10,000 pounds. This is not the strongest of weight distribution hitches in this review, but it might still get the job done so long as your trailer falls into its threshold. The pair of chains and u-bolts are pre-installed on the hitch, so no effort is required on your end to put the hitch together. Everything you need is already inside the box, so all that is needed on you is to hook it up to your RV. The shank is ten inches long by two inches wide by two inches deep. The shank included with this hitch has a 5.5-inch rise and a 2.5-inch drop. This hitch also features a standard ball mount for towing about smaller vehicles like cars and ATVs. Like Anderson’s hitch, this one too keeps the connections stable via a pin. If this pin breaks, then you will need a new one in order to use the hitch once again. You should have have much of a problem with the pin, as it is less prone to bending or breaking. This is a more affordable weight distribution hitch than the average hitch. While this hitch is only able to haul just five tons tops, we feel that you are still getting a good deal for your money’s worth. This weight distribution hitch comes with a stellar five-year warranty. This is more than a decent amount of time for you to see if this hitch is defective and need to send it in. Should it be proven that there are manufacturer defects on this hitch, you should get a new one for free. Camco will be able to replace any bad parts that you might end up getting, so if your kit is mailed with a part that is damaged, you should be entitled to another part that works. This hitch might require some welding work if it does not fit properly onto your bumper. If you do not have welding resources or experience, a mechanic should weld the hitch for you with the proper configurations to make it fit onto your trailer’s bumper like a glove. Might need to be welded. This next weight distribution hitch is brought to us by Anderson Manufacturing. The hitch and clamps are connected by tough, steel chain link that cannot be pulled apart. This is a sway control hitch that is known to adjust itself in the wake of any unexpected happenings. The ball and coupler in this hitch move as one. Together they offer a grease-free system, allowing you to not need anything else for setting up and using this product. To unhitch your trailer from your driving vehicle, all that you will need is to pull out one pin. That pin is sure to stay in and never wear down during the duration of your travels. If the pin breaks, then it shouldn’t be that hard to replace it. The shank included with this hitch has a four-inch rise and a four-inch drop. This hitch also features a standard ball mount for towing about smaller vehicles like cars and ATVs. A plethora of frame brackets are included with this weight distribution hitch. From three inches to six inches, there is certainly one that should be able to fit your bumper, specifically. This is one advantage over the Equal-i-zer’s that is worth mentioning. This is another reliable weight distribution hitch that can help tow the biggest and heaviest of trailers. 14,000 pounds equates to seven tons, which means it could possible move two trailers at once. We wouldn’t recommend it, but it certainly would be quite a feat. Even if you have a hitch that stays inside your lane, watching the trailer bounce or rumble can make you rather uncomfortable. This weight distribution hitch, however, keeps the trailer from doing that as you have it hauled behind your vehicle. One thing we are not certain on is the warranty, we know that one exists with the purchase of this weight distribution hitch, but there is no indication how long it lasts; whether it be for one year or forever. We will assume that it is just for one year. The pin is likely the biggest achilles heel throughout the entire system. If the pin doesn’t work, then you are out of luck. If the pin is bent, then there is no way to get it back in the hole to secure your hitch completely. As we said before, you can likely get it replaced, but that is likely not what you want to resort to. Keeps the trailer from bouncing or vibrating. Husky is next to show us their weight distribution hitch, which is made entirely in one piece. The type of sway control that this hitch has is friction, so it is very important to not use a separate friction sway control peripheral along with it. The whole body of this weight distribution hitch is made entirely of stainless steel. Not only will it reduce the amount of rust buildup and corrosion over time, but it is built to last, too. This hitch will certainly last for a number of years before you will need a new one. The fact that this hitch is made of entirely one piece will make it very useful in some facets, but a real nuisance in others. What is great about this is that you won’t have any pins or connections to worry about coming undone or breaking off. Even the ball is built inside and cannot be removed or disconnected. The hitch overall is capable of hauling a load of up to six tons in weight, or 12 thousand pounds. This hitch can be able to tow a fairly large RV. This is a rather low-riding hitch from off the ground. While the installation is easy, it may not be anything that you are used to if you have used a trailer hitch before. There is some decent amount of work that was put into the sway control features, making the hitch react to sway much earlier than other hitches in this review. This is an affordable weight distribution hitch, and Husky really tries to make it a value. The performance we got out of this hitch is in the form of a stable and quiet ride for us and the RV we hitched. This weight distribution hitch too offers a limited lifetime warranty. This could give RV owners all the more reason to choose this hitch, overall, in addition to the reduced price that is being offered, here. The one takeaway from this weight distribution hitch is that is it rather noisy. You will not hear anything when driving straight, which is good, but when you turn is another story. When turning, you’ll hear metal parts run together to make a squeaking or squealing sound. It may sound really scary and unsafe to you. We hope that nothing bad happens from this, but there are other hitches that simply don’t have this nuisance. Pro Series is the creator of the last weight distribution hitch that we will be looking at today. This hitch offers friction sway control and a tension handle for adjusting in wet and slippery conditions. This is the weight distribution hitch out of the whole review where the most assembly is required. This might disappoint some RV owners who don’t have the patience to put together a hitch, but perhaps the low price justifies the effort it would take to set it up on your own. Once it’s done, you may be glad you saved some money. This is another hitch with a body that is made of stainless steel. It is guaranteed to last a long time and will continue to look like brand new. In wet or icy conditions, turn the handle off. This removes all the tension from the RV, which you need in order to keep the RV moving along. If you leave the tension on, the RV will be harder to maneuver and control. This weight distribution hitch includes a warranty that lasts for ten years. Ten years is a great amount of time for your hitch to be covered. If your hitch doesn’t come with all the parts, Pro Series is sure to send them to you so long as you bring it to their attention. This is the most affordable hitch in this review. It does not seem to offer much, but if you just want a hitch that does its job well, this is a good one to buy, nonetheless. The fact that you need to assemble this weight distribution hitch yourself seems like a real turn off to many RV owners. Assembling these hitches is no easy feat, and you will need to read the instructions carefully from beginning to end to ensure a successful set-up. If you have experience working with hitches, this should not be as grueling as you might think. Furthermore, if your RV has surge brakes, then you should not buy this hitch. We aren’t sure what might happen if you do install this hitch on an RV with surge brakes, but it is best to not take any chances considering that the manual will warn you about it. Will not work with surge brakes. If you are uncertain about how RV and weight distribution works, or you are looking to use a trailer or RV for the very first time, there is some very important information about trailers and weight distribution. Weight distribution is what you need essentially for you and your RV or trailer to remain safe during transportation. Read this guide in order to understand how weight distribution works and what hitches do in order to distribute weight for trailers. Distributing weight is necessary in order to keep driving safe while you are towing your trailer behind your vehicle. Weight distribution is to keep the trailer balanced so that it doesn’t have a chance of falling over or affect your driving performance. Driving with trailer weight that is unevenly distributed can be dangerous, more so when you need to drive faster. Weight distribution will also drastically impact our handling and braking for the better. As far as braking goes, weight distribution means that the all the momentum from the trailer is no longer at the front of it. This means that there is much more momentum on the back of the trailer so that when you brake, the trailer doesn’t continue to move forward. Weight distribution also gives equal momentum on both the sides of the trailer or RV. This means that when turning, the RV will cooperate without extremely veering to the side that you are turning. No matter where you go with your trailer, weight distribution is important to make the trailer safely move behind. Weight distribution works, obviously, with a weight distribution hitch. This hitch balances your load from the front of the trailer to up to its axle. Weight distribution allows all areas of the trailer to get even momentum at all times, rather than all the momentum going to the front. Weight balances the overall weight, including everything inside of the trailer, so even everything inside like appliances should stay put. Sway control is meant to limit where the trailer sways when connected to the towing vehicle. Sway control is a very useful feature that is meant to keep the trailer in the driving lane and out of danger. Without sway control, the trailer could unpredictably sway into danger. The trailer could sway into the opposite lane and could be hazardous to other vehicles. The trailer can also sway off the road, potentially coming into contact with trees, parked cars, downhill slopes and more. Sway control should also be able to keep the trailer from turning over from making a hard turn. There are many types of sway control utilities, such as two-point, four-point, dual cam and friction. A two-point sway control is the simplest of sway control types. These systems just have sway control at the ends of spring arms on both sides of the trailer. An L-shaped bracket is also included to allow trailer owners to manually adjust the tension that the trailer needs to cooperate the best. Friction sway control involves a telescoping bar along with friction pads to limit the swaying of a trailer. This system allows you to adjust the tension so that you can choose the correct amount of resistance. Aside from attaching to a weight distribution hitch, it can alternatively be connected to a ball bearing mount. Dual cam sway control uses preventive measure so that it stops the trailer from swaying altogether. There are two of what are known as “cams” that lock in place on both sides of the trailers in other to apply ongoing pressure. This prevents swaying from happening and leads to a tame trailer while you make turns. This system works with weight distribution hitches that have spring arms. A four-point sway control is everything that a two-point sway control is, and then some. There are two spring arms on each two sides of the trailer, but there are also an additional two where the bars mount in the front. The sway control can resist the swaying of the trailer, but the force applied to the system from your driving vehicle still makes it possible for you to turn. There are five primary parts that every weight distribution hitch will come with. These parts include the trailer hitch receiver, the adjustable shank, the head, the spring arms and the lift brackets and chains. If the hitch that you are considering doesn’t come with one of these things, please reconsider your choice, as they are all necessary for proper connection. The trailer hitch is the primary component that is responsible for connecting your driving vehicle to the RV or trailer that you want to transport. To complete a connection, a trailer hitch may also require additional components, such as a trailer ball and ball mount, so that the connection doesn’t come undone when driving. An undone connection most likely leads to a trailer that is dangerously stopped or moving in the center of the road. The shank is the part that slides into the entryway of the weight distribution hitch and offers a point of attachment for the head assembly. Shanks can come in different drops, rises and lengths to give you a threshold of adjustment depending on how high your trailer sits at. The head is the part of the hitch that the spring arms go into. It also holds the ball and connects to the distribution of weight accordingly. The head assembly of this weight distribution hitch varies by weight, and each hitch should have its own set of components. In order to replace the head, just read the part number that the head has and order the part that has that same number. The spring arms attach to the head assembly of the weight distribution hitch. There are two main types of spring arms: Trunnion arms and round arms. We do not necessarily one type to be better than the other, so choose the one that works best for you and your trailer. Trunnion arms are meant to slide right into the head assembly from either the sides or back. Round arms slide up into the head assembly and are secured using clips. Last, but not least, there are the lift brackets. They are what connect the trailer mounted brackets to the spring arms. The snap-up uplift bracket happens to be the most popular type of lift bracket. This bracket grabs the chain at a low angle, and then raises and snaps into place. Weight capacity is one of the most prolific factors when pertaining to choosing a weight distribution hitch. When looking for a capable hitch, you should choose one that has 50 percent more gross trailer weight compared to the tongue weight. With a weight distribution hitch like this, you can be sure that driving controls are easy and the distribution of weight makes the trailer overall tame while driving. Gross trailer weight can lie in between ten to twelve thousand pounds, or five to six tons. As you may guess, this is the overall weight of your RV or trailer. Any weight that you add to the trailer, however, is factored into this weight. This includes people, goods and equipment such as generators and off-road motorcycles. The tongue of your RV or trailer refers to the spoke that comes out the rear. The tongue weight is expected to be around 10 to 13 percent of your trailer’s gross trailer weight. The weight doesn’t refer to how much the tongue weighs, but how much force it has when hitching. Tongue weight allows you to harness the trailer while hitched, making your drive overall safer. Weight distribution hitches, like trailer hitches in general, are identified in different classes. Class 1 is for the smallest and lightest vehicles, while class 5 is for the largest and heaviest. We strongly suggest that you choose a hitch that your vehicle’s class falls under. Please do not use a weight distribution hitch for a trailers that is beyond your vehicle’s class. The five classes are as follows. A hitch with weight distribution can either have sway control built into it, or does not include sway control, but is compatible with an add-on feature that enables it. There are some significant differences that we will go into detail for you. A weight distribution hitch that has built in sway control will rely on friction from the spring arms to their respective mounting brackets that are connected to the trailer’s frame. The spring arms are clamped down onto these brackets as they distribute the weight of the trailer tongue to the axle in front of the trailer. The sway is limited by creating friction between the brackets and the spring arms. For weight distribution hitches that require add-on devices, it attaches to one side of the hitch, usually in between the frame of the trailer or RV and the head of the hitch while it is mounted on your trailer or RV. This type of sway control too creates friction, and this friction is adjustable thanks to a handle that you can crank wither up or down. The caveat to an add-on sway control is that is is very important to remove them for when you have to back up or make tight turns. If also needs to be taken off if you have to drive on gravel or sand, or when there is precipitation. A weight distribution hitch with a permanent sway control is much more worth getting, considering that the add-on systems have just too many limits for what you can do with it. Not only that, but the add-on sway systems that you need for hitches without them just do not perform as well. There is only one weight distribution hitch that stands out above the rest, and that is the Equal-i-zer 4-point from Equal-i-zer. This is a rather pricey weight distribution hitch, but that price can be explained easily with limitless quality. 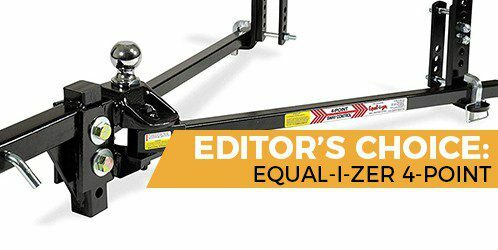 Equal-i-zer has a strong hitch here that keeps your RV pretty tame when hauling it, and the connection is also a super secure one, in addition to that. When you are not using your RV, you can also use this hitch to tow cars, boats, trucks, utility trailers and more, making it a very useful product that you can enjoy more often than not. On top of all that is offered, the lifetime warranty just sweetens the deal. Use it or wait until you own an RV, and no matter when you realize there is a problem with the trailer hitch, there won’t be any problems getting it replaced by Equal-i-zer. The warranty won’t, however, be honored if the hitch just goes through wear and tear.